My body, its resiliency, strength, and ability to get me from point A to point B, its many pleasures. My friends, the ones who sent notes of love and hope and silliness during a recent difficult time. Family, the love, joy and challenge of being in relationship. 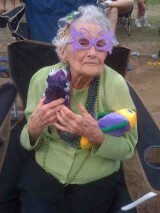 Women, like my Aunt Emma–I hope to be having as much fun as she was when I’m 99! Water, especially rivers and the sea. Inkpot Cottage, my home in the UK. Words and ideas and the joy they never fail to bring. Thanks to everyone who has been part of my life for the past fifty years. Here’s to many more moments of good food and drink, conversation, adventure and pleasure. Here’s a song that’s been playing in my head lately, which a local band, The Bridge, introduced to me during a recent set in Cheltenham. So lucky to feel lovely!